Glencore, according to statista.com is the world’s largest mining company by revenues. As a way of introduction, here is what statista.com has to say about Glencore. The four next mining corporations in world ranking include BHP Billiton, Australia; British-Australian Rio Tinto; China state-owned Shenhua Energy, and Vale, Brazil. Their mining practices may not differ a lot from those of Glencore’s. However, what distinguishes Glencore is its particularly aggressive business style. Aggressive from all points of views – tax avoidance, corruption, total neglect for employees as well as communities they work in, non-responsiveness to critique. Though it looks like Glencore’s aggressive business model is paying off. Glencore’s tax rate negotiated in Switzerland is next to zero. The Canton of Zug, where the city of Baar, seat of Glencore’s headquarters (HQ) is located, is the number one tax haven in Switzerland – Glencore pays 0.2% taxes on its net earnings. According to my own experience with mining companies in general, particularly those operating in Peru, corroborated by a former mayor of Espinar, as well as people working for Glencore and living in the vicinity of Glencore’s Alta Huata (Espinar) copper mine, the mine is neglecting any social and environmental laws or even humanitarian standards. Toxic effluents from their refining practices are largely untreated and simply released into water ways, poisoning the environment, including people, eventually killing them from cancer and other debilitating neurological disorders. Former mine workers interviewed said that once they got sick, likely from the mine’s toxins – foremost heavy metals in the water they ingested, or from inhaling fumes emanating from the refining processes – they were dismissed, without compensation or medical care. People living in mine-surrounding communities suffer from a similar predicament – contaminated water and soil. And again, no compensation or care from Glencore. Average life expectancy in South America for a mine worker is about 49 years, about a third down from normal male life expectancy. Estimates from medical specialists in mine workers’ diseases in the Cajamarca region of Peru range from about 32 to 42. 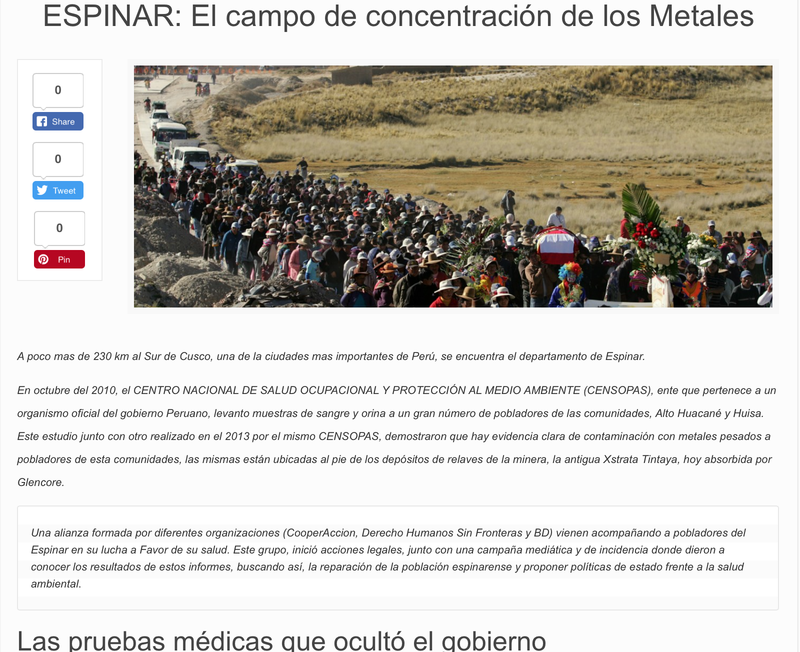 This article looks specifically at an event which I witnessed and was able to interview victims about, at Glencore’s copper mine in Espinar, near Cusco, Peru, some 4,200 m above sea-level. Gold is a side product. Where there is copper, there is often gold to be found and vice-versa. The mining and refining of both metals is highly toxic, leaving poisonous heavy metals, such as mercury, cyanite, cadmium, arsenic, chromium, lead and many more disease-causing toxins in water, soil, and air, poisoning fauna, flora and humans. 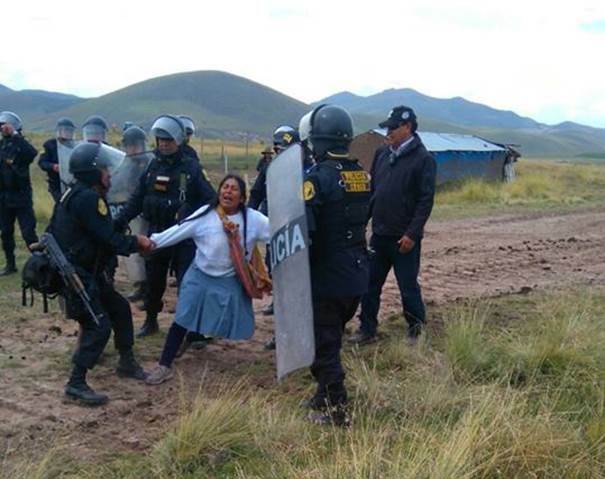 On April 3, 2018, a dozen or so indigenous unarmed, women – the poorest of the poor –protested with their bare hands in defense of their only water way left, a small stream. Glencore wanted to deviate it – totally illegally – for Glencore’s use. The women were attacked by police in full riot gear, beaten with batons. It is openly known that Glencore, like other mining corporations, literally buys the national or local police services for this type of abject brutality. “…Glencore has had a presence in Peru since 2002 and since that time, we have worked closely with our host communities to maximize the benefits of our activities and minimize or avoid potential negative impacts. On 3 April 2018, workers from the Antapaccay [Alta Huata, Espinar] copper operation were carrying out construction activities on a canal that is situated on the mine’s property. Antapaccay acquired this land in 2009. During the constructions work, a small number of women illegally entered Antapaccay’s property and began to throw stones at the workers. Concerned for the safety of its employees and equipment Antapaccay contacted the Public Prosecutor’s Office in Espinar. Antapaccay is legally obliged to inform the Public Prosecutor’s Office in the event of social unrest. 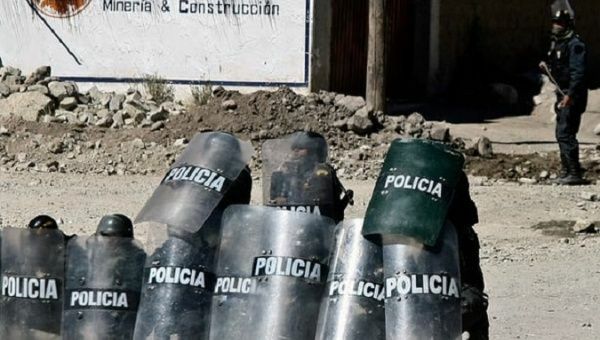 The Public Prosecutor´s Office requested that the local police access Antapaccay’s property to restore order and peacefully withdraw the women. Of course, no word of police brutality. But Glencore admits that they were building a ‘canal’ [deviation of a small stream] which is what the women protested about. Even if this canal work was on Glencore’s property, that does not give Glencore any right to reroute the water way. Water is a public good and it’s the only still available water source these villagers have. Hence the protests. The police were helped by Glencore’s own security forces. All this was recorded on video and in photos. Arriving the following day on location with a group of locals, we interviewed several of the victims. See also my earlier article on the subject. As the above essay went to press, I wrote directly to Glencore’s CEO, Ivan Glasenberg, suggesting a personal meeting to discuss the event and the general circumstances that led to it. Mr. Glasenberg replied promptly through his director for Sustainable Development (sic), who proposed to meet – which we did, in a neutral place, a hotel lobby in Bern. The Glencore delegation consisted of the Sustainable Development director and her lawyer. – I was alone which was unfortunate, as I had no witness for what transpired during a roughly two-hour non-confrontational, rather peaceful dialogue. I recorded the substance of it in an Aide-Memoire, asking for their approval, comments or suggestions for change. The answer a few days later was a full rejection, saying none of the contents of the AM reflected our conversation. This is of course a flagrant lie. Under the circumstances, I decided to make the gist of our two-hour conversation public, as reflected in the Aide-Mémoire. Blood and urine samples – people who are sick from intoxication with mine effluents, working for the mine and / or living in the close vicinity of the mine, sought testing their blood and urine for heavy metals. They were never given the results from the tests from medical doctors, clinics and laboratories. Why? Addressing point by point, starting with the Beating of unarmed women – the dozen or two bare-handed indigenous women were protesting in defense of their water against Glencore workers, wanting to deviate, actually steal the little stream for Glencore’s own use. They were brutally beaten by national police in government issued riot gear – imagine! – in riot gear – with the help of Glencore’s own security forces. This happened around noon on 3 April, when the women were alone, even more defenseless, while village men were working at the mine or in their small agricultural plots. According to several accounts from the local population as well as from people in the town of Espinar, Glencore intended to reroute the small stream providing the only water source for the six or so villages higher up on the mountain. This is further corroborated by the large pile of big-sized pipes, deposited on the land next to the small stream. A nearby gigantic earth moving machine and fresh tracks traversing the small water way were also clear signs that water deviation works were planned. In the early morning hours of 4 April, we went to Glencore’s copper mine at Alta Huata, about 4,200m above sea level, to meet with the mistreated women and to interview them. Still affected by indignation and pain, some of them under tears, showed us their badly bruised body parts. Evidence of the police assault and aggression by Glencore’s security forces is available as independent testimony in the form of short videos and photographs. 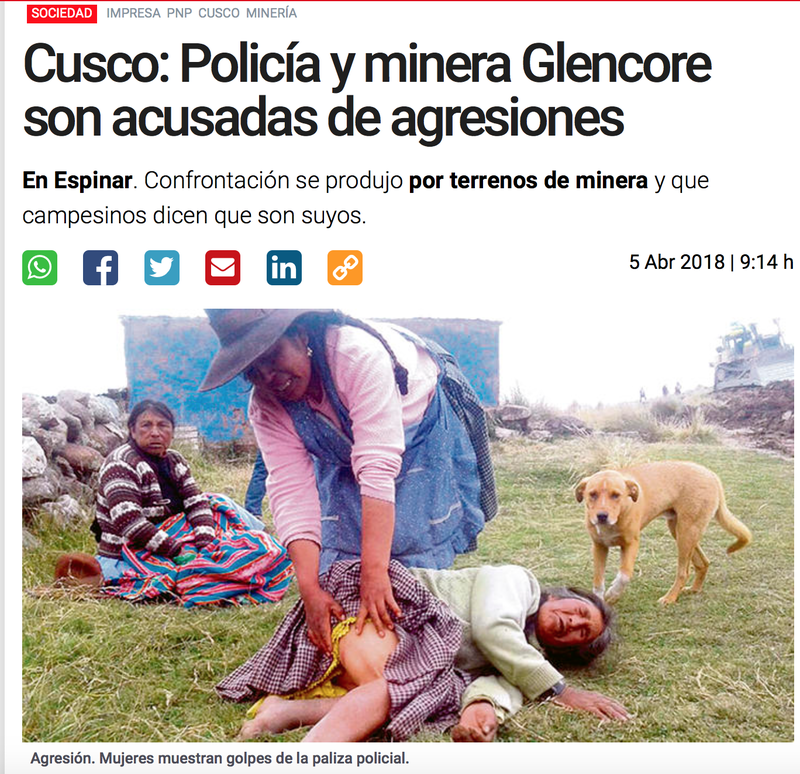 An elderly woman (65) was beaten so severely, she was resting and moaning in a rickety stone shack which apparently was destroyed by Glencore’s bulldozers the week before and hastily rebuilt by the local population. The woman had pain all over her body, could not move, and got no medical attention, no pain medication – nothing – she was a ‘high risk’ case. Later, we learned, she was miraculously recovering with the care of the villagers. The villagers told us they wanted to file a complaint with the local police which did not receive them. It is clear, if Glencore hired the police to do their dirty work, they, the police, will not receive the villagers’ complaint. It’s a revolving-door corruption at every level that is being practiced. I wonder whether Glencore’s boss, Mr. Glasenberg, is aware of it. If not, then at least this article which will be sent to him should remind him that he is complicit in serious crimes of his company by letting them happen. During our meeting, the Glencore ‘sustainable development’ people said the workers were only doing repair work when the women appeared interfering with their job. Another flagrant lie, as attested by Glencore’s own response – see above. But how could they know? They are repeating what they are told by their people on the ground – and were unaware of Glencore’s response to the Business and Human Rights Resource Center? Whenever they go to visit the area, we understand, they never set foot in the affected villages, to talk to the people or to the mayor, but only talk the inside-talk to Glencore insiders, another revolving door approach to resolving problems by being blind to them and keeping perpetuating the lies. The sustainable development people of Glencore’s also denied that Glencore had anything to do with the beating, that Glencore could not control the police. They dismissed the assertion, against all evidence on video, that Glencore’s security forces were also involved and, of course, that they actually called and hired the police in the first place. Later we talked to villagers who lived in the mine-surrounding areas. With anguish, sadness and even resignation, they told us that Contamination of water, soil, air, flora, fauna – and humans was evident. It appeared in the water ways and was reported in soil samples. Plants adjacent to water courses, rivers and effluents from the mine, were all contaminated by heavy metals, poisoning animals, as well as humans. Farm animals became sick and often died. This is amply recorded (available in Spanish only) by Ideario Sur. Many inhabitants of the mine-surrounding communities, so we were told, including by the former mayor, were sick with cancer and other terminal diseases which were caused by contact with or ingestion of contaminated water or food. To purify water efficiently from heavy metals – cyanide, mercury, lead, arsenic, cadmium and more – a complex and expensive process is required. It’s called reverse osmosis. In most cases, mining companies do not use this process. In the case of Glencore and Espinar, reverse osmosis is not in use, leaving the effluent waters highly and dangerously polluted. We talked to several people, some working for the mine, others just living in the immediate vicinity of the mine – say, in a radius of 1 to 5 km. All said, they felt sick; their bodies hurt, they had respiratory problems and many suspected having different types of cancers, mainly lung cancer. The disease rate increased the closer they lived to the mine. One of the peasants said that young people in his neighborhood were dying “like flies” from cancer. He added that the average life expectancy of people living near the mine was drastically reduced. He also said, that most people by now are just resigned to their fate and were tired of protesting and being frustrated, because Glencore would not respond and do nothing for them. They felt helpless. To top it off, Glencore’s Sustainable Development people said that Glencore received certification from the municipality that the effluents from their mine were clean and not contaminated by the mine, and that it was common knowledge that the water was not potable, ridiculously ascertaining that contamination occurred naturally in these mountainous streams. This abject manipulation of the truth would be laughable, if it weren’t so serious. But the people have no recourses to hire lawyers, and even if they would have the money to do so, no lawyer, no judge, no court would take on a case against Glencore. They are afraid to confront the mobsters from where the money flows – corruption at infinitum! Glencore’s sustainable development representatives rejected all responsibilities for the contamination and said they had no knowledge about the disease rates reported by the local population. They were never informed. Well, if they didn’t know, they must know now. And Mr. Glasenberg would do well sending an HONEST delegation to Espinar to verify with neutral experts on location the veracity of this account and of the account of the victims. Question is, of course, will there be uncorrupt neutral experts daring to tell Glencore the truth? – And even if that were the case, what would Glasenberg do about it? Glasenberg is the key person. It’s a family business, one of the world’s largest – so if he wants to change the way Glencore does business, he can do it. Who manages Glencore’s mines on the ground? – Mainly locals, we were told. In Espinar, Peru, it’s a Peruvian. This has two purposes. First, a Peruvian is familiar with the local ‘habits’ of how the ‘turntable’ turns, how to buy favors and how to threaten potential adversaries; and second, if something goes wrong – like in the present case of brutally beating of inoffensive women, deadly contamination and people dying from cancers caused by intoxication from mine effluents – they, at Swiss HQs can say, we didn’t know; nobody told us. The we didn’t now effect, seems to be effective, so effective, in fact, that the entire conversation of two hours was annihilated by the sustainable Glencore people. Even though the conversation took place as recorded, the sustainable people deny its contents. We also talked with people, who lived in the vicinity of the mine, who are feeling ill for years and worsening, mostly the lungs, but also their respiratory and nervous system, yet mine management not only ignores them, but also prevents them, directly or indirectly, from getting their Blood and urine samples tested, paid for by the victims themselves. We were told that many of the people living in the communities near the mine, including the people who spoke with us, consulted doctors, clinics, hospitals, laboratories on their own, to get their blood and urine tested for heavy metals. They never received the test results back from these medical establishments. The truth is beyond suspicion – these medical facilities, are either bought by Glencore, or they fear Glencore to a point that they prefer not to hand out negative health results, of which they know from where they emanate. – The people also said that they get absolutely no medical support from Glencore. They pay their medical expenses from their own pockets – and yet, they are refused to see the test results. Diseases stemming from heavy metals have often long gestation periods, i.e. cyanide and mercury do not necessarily lead to immediate symptoms, rather the impact may be slow, because heavy metals accumulate in the body and are not evacuated as other toxins may be. They affect over time the nervous system, respiratory tracks, the heart and often cause cancer – and lead to early death. It is well known, that mine workers in general in developing countries have a drastically reduced life expectancy, i.e. in some parts of Peru and Bolivia an average of around 35 years. The director of the Sustainable Development Department appeared to be shocked. She was unaware, she said and in an outburst of good will, she offered that any of the people who were sick and concerned may call her directly. Of course, none of this was even acknowledged once they received the Aide-Mémoire. The moral of this story is multifold. There is Glencore, the largest mining corporation in the world, largely a family business, with Ivan Glasenberg, main shareholder, at the helm. 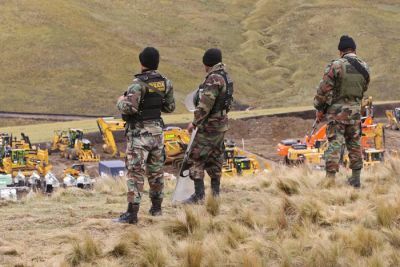 He could personally intervene, stop the abuse and high crime, bringing about ‘as clean mining’ as there is, respecting environmental and social ethical rules, regardless of whether the country, where they operate, in this case Peru, is corrupt and can be bought. Glasenberg, the CEO, could become a shining example for ethics in mining which would bode well for the company as well as for the host country, Peru, and not least for their country of residence, Switzerland. The cost of implementing ethical environmental and social standards would hardly make a dent in Glencore’s net earnings, but the gains in positive reputation and improved image are priceless. On the other hand, you have Switzerland that offers this UK-Swiss mining corporation their tax haven as residency. Yet, the Swiss Government does absolutely zilch, nothing, nada to impose and enforce certain standards of ethics to Glencore and other corporate sinners enjoying the Swiss tax paradise. Talking with people from a so-called Ethics Department (sic) in the Swiss Ministry of Foreign Affairs, the hush answer was, if we are too strict with them, they will leave Switzerland – and as an after-thought, besides, they [these corporations] have their own standards of due diligence and we trust that they adhere to them. If they don’t, then it’s up to their host country, i.e. in this case Peru, to enforce their laws. Here you have it. The Swiss Government, the paradise for banking and finance and corporate ‘well-being’, the epicenter of neoliberal economics, where privatization reigns, is knowingly and intimately complicit in the crimes committed by these corporations. No wonder, the lawmakers, the Swiss parliamentarians, are entitled to sit in as many corporate boards of directors they please – against all rules of ethics and ‘conflict-of-interest’ guidelines of OECD, of which Switzerland is a member. This built-in lobby of parliamentarians is making the laws in their favor, operating on a ‘legal basis’, not unlike a white-collar mafia.